At 22:30 last night a patrol is sent out by the Yorkshire Regiment. They find the German wire uncut so they work cutting wire until 01:10. The raiding party gets into the German trenches at 01:30 and then at this very moment the enemy front trench is heavily bombarded by British artillery in error. Four members of the raiding party are killed and 15 wounded among the dead is Second Lieutenant Cecil Hawdon (Yorkshire Regiment) killed by friendly fire from British artillery at age 20. He has two brothers, one will be killed and the other dies both in November 1918. Sapper William Hackett (Royal Engineers) will be awarded the posthumous Victoria Cross for bravery when entombed with four others in a gallery at Shaftesbury Avenue Mine, near Givenchy, owing to the explosion of an enemy mine. After working for 20 hours, a hole is made through fallen earth and broken timber, and the outside party is met. Sapper Hackett helps three of the men through the hole and could easily have followed, but refuses to leave the fourth, who has been seriously injured, saying, “I am a tunneller, I must look after the others first.” Meantime, the hole is getting smaller, yet he still refuses to leave his injured comrade. Finally, the gallery collapses, and though the rescue party works desperately for four days the attempt to reach the two men fails. Sapper Hackett well knowing the nature of sliding earth, the chances against him, deliberately gave his life for his comrade. Sapper Hackett was born 11th June 1873. He worked as a miner for 23 years in the Nottingham and Yorkshire coalfields, and was married. 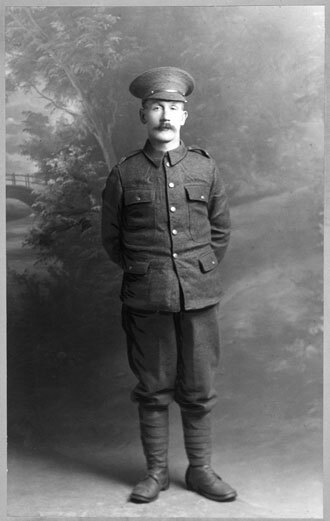 He enlisted in the 254th Tunneling Company, Corps of Royal Engineers, in October 1915, after being rejected three times by the York and Lancaster Regiment for being too old. Lieutenant Frederick Leonard Pusch DSO (Irish Guards) is killed by a sniper at age 20. His brother, who is the best friend of A A Milne will be killed in six weeks. Second Lieutenant Wallace George Langford (King’s Royal Rifle Corps) dies of wounds at age 20 received two days before trying to rescue his men when they are being bombed by trench mortars. His brother will be killed in September of this year. Corporal Percy Grenfell Simmonds (Liverpool Regiment) is killed in action. He is the son of the Reverend Delasaux Egginton Mount Simmonds Vicar of St Andrew’s Ramsbottom. Private John Biswell (Bedfordshire Regiment) is killed at age 19. His brother was killed last month. Private Robert McLean (Central Ontario Regiment) is killed in action at age 29. He was a constable with the Vancouver Police Department. Private David Saxton (Lancashire Fusiliers) is killed. His brother died of wounds last December.